This year Bloomington started up a new food event called Devour Btown. It started February 25th and runs through March 8th, so check it out while you can! Lots of restaurants around town are participating in it with either prix fixe menus or other deals. Some of the deals are really great ones. Eric was out of town this past weekend and I have to keep myself busy while he's away, which usually means calling up all my friends to see if they want to hang out. My friend D was the only one available for dinner, so he and I went over to Function Brewing to try out their Devour Btown menu. 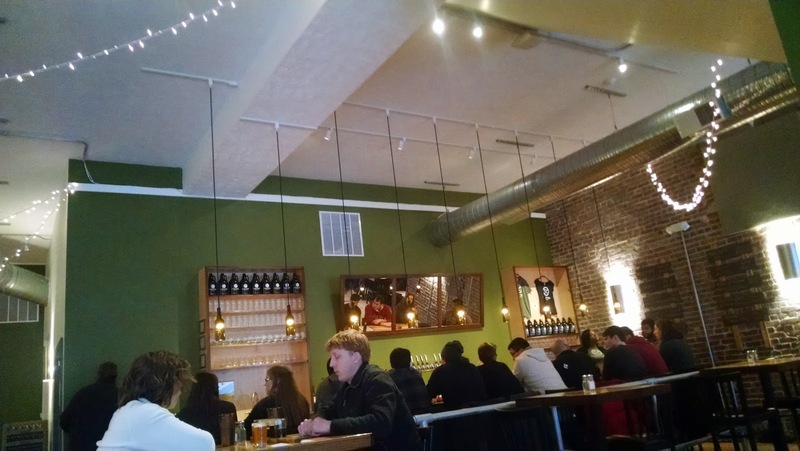 The Devour Btown deal at Function is one of the best (if not the best) deals going on. They have two options, a 2 person for $30 menu or a 1 person for $15 menu. You get slightly different options with each. D and I opted for the 2 for $30 since we wanted to try out an appetizer (not a soup or salad). We ordered the Goat in a Jam appetizer (great name, right?) to start with as well as a couple of beers. 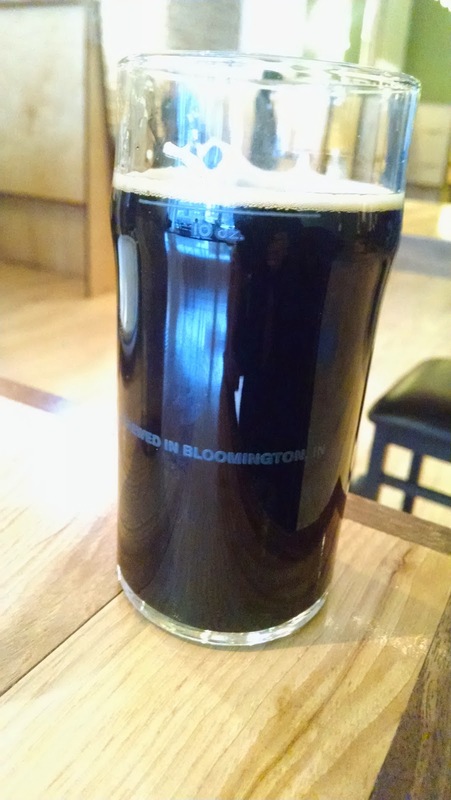 They had a new beer, an orange vanilla stout, on tap that I sampled. It smelled exactly like a creamsicle. It tasted good but the end was very orange-y and I wasn't really in the mood for that kind of aftertaste, so I went for the Imperial Milk Stout instead. It was very smooth and a little bit toasty, perfect for the weather outside. The Goat in a Jam arrived quickly and we realized we were really the ones in a jam. This appetizer is huge and could have been our whole meal. (And we can attest to the fact that the other appetizer you can get, the hummus one, is equally huge and delicious-looking.) Function knows how to do it right. 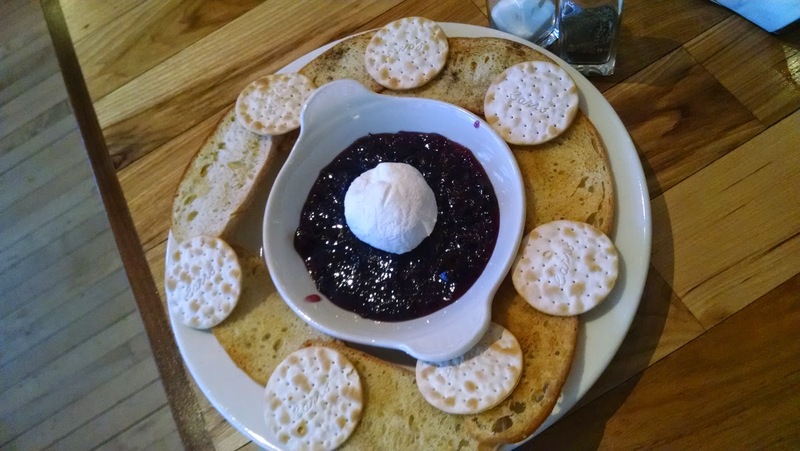 The goat cheese was smooth and spread easily, the fig-onion jam was really good (I love cooked onions), and the crackers and bread were just the right crunchiness for this. We only finished half of this before our main dishes came out. D and I decided to each get a sandwich and then trade half. He got the Mushroom Kingdom, which has butternut squash, arugula, and mushrooms on it. It was pretty good even with arugula, which I don't much like. I ordered the ratatouille. It is maybe the best thing on their menu (and it doesn't even have meat, so you know I-the-meat-eater must think it's good). Zucchini, cheese, sauce, pesto, can't go wrong there. It is served warm and is delicious. 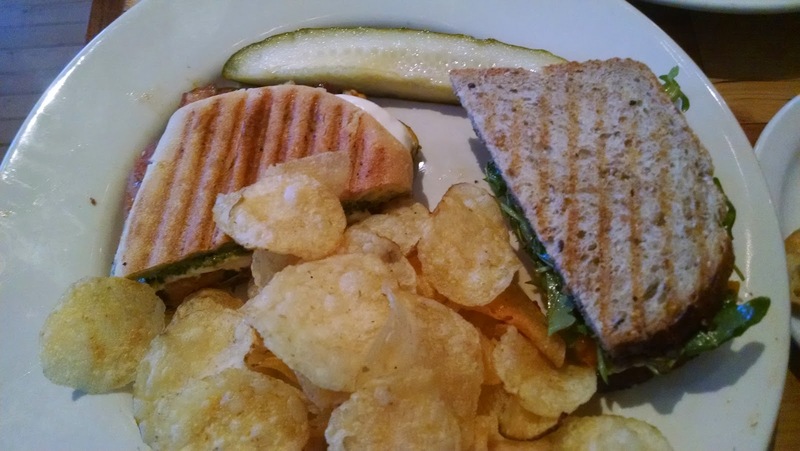 The sandwiches come with chips or coleslaw and a pickle. For dessert we could have a stout float or a Mexican chocolate cake. Since we had already had stouts we got the Mexican cake. You should too. The cake part is thick but not dense or heavy, and is not too sweet. The whipped cream is spicy and should not be eaten without the cake part if you can't handle any kind of spiciness (like me). But with the cake, it is so good. Then there are chocolate shavings on top. The cake didn't feel like a heavy dessert, which was nice after all that other food. 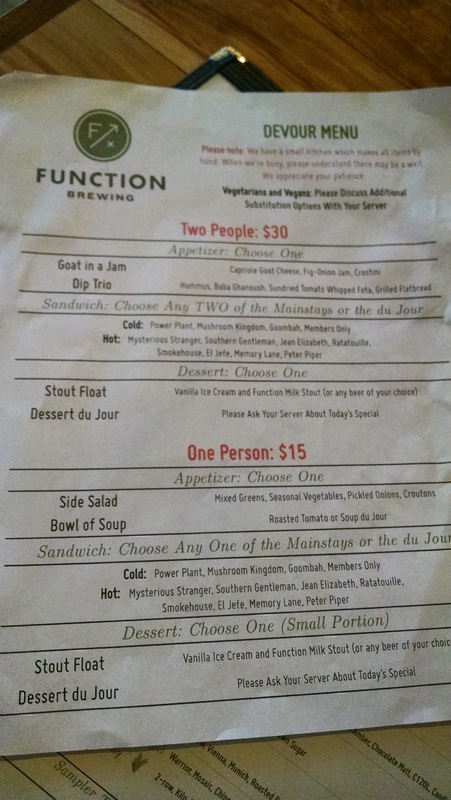 So we know at least at Function you get a great deal (it's basically $4 off per person) because of the portion sizes. 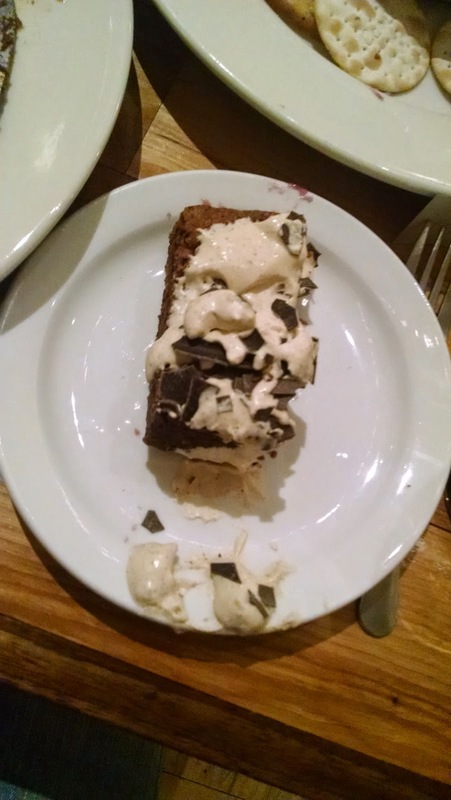 I could have saved half the appetizer, half my sandwich, and half my cake for another meal and still be stuffed. So you should go check them out until March 8th, or try another restaurant participating and let me know about it. Bon appetit!